Idea 0. Create your own! Idea 4. BioGPS. Advanced gene annotation tools: ID mapping and user table annotation. Idea 7. BioGPS. 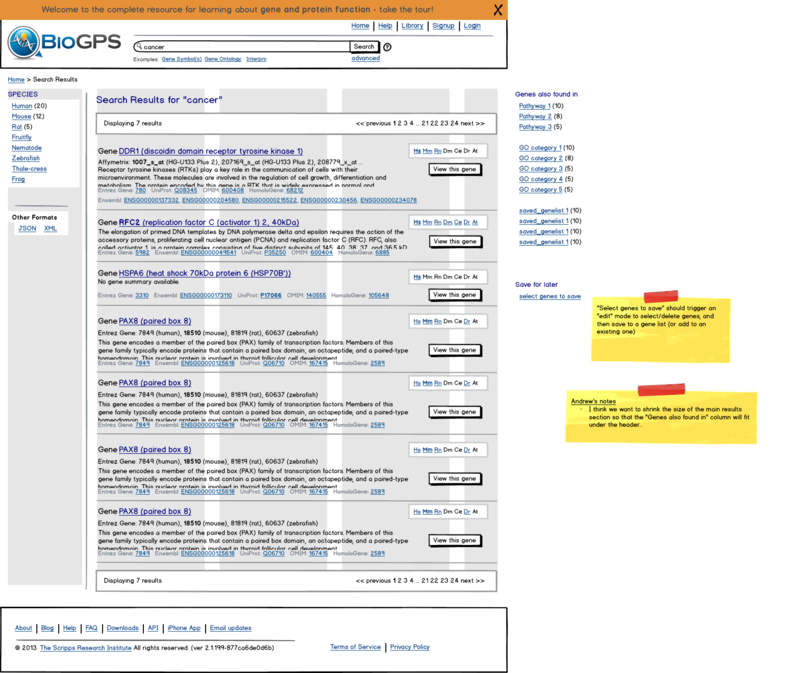 Add plugin to display content from Semantic BioGPS. Feel free to propose your own idea. As long as it fits within the general space of ‘crowdsourcing biology’ we would be thrilled to consider it. Please be detailed about what the specific goal would be, why it is important and how you plan to achieve it. Background. Code developed by our group helps to maintain more than 10,000 articles about human genes on Wikipedia. 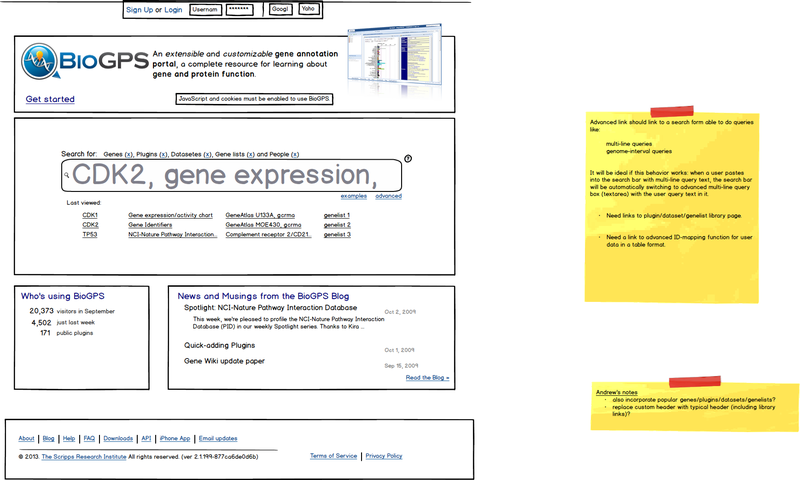 All of the page elements highlighted in orange below are generated by a program that gathers information from trusted public databases (accessed via MyGene.info) and inserts it into the right structure at Wikipedia. Collectively the articles are viewed more than 50 million times a year. Wikidata is a brand new development at Wikipedia. Its goal is to create a free database that anyone can edit. The aim is to collect all of the “structured data”, the elements of infoboxes for example, into a central, queriable database. Articles on Wikipedia can query this database to access and then render the content much like other web applications. In addition, external web applications can dynamically query this content to enhance their own content. The goal of this project will be to migrate the data that we currently store in template pages in Wikipedia into the wikidata database. For example, we now get data from mygene.info and add it to templates like this one for the gene Reelin . We would like to move that data instead into the wikidata page associated with Reelin. This will allow us to query the database, others to edit the database, etc. in a much cleaner fashion than we can accomplish working inside of the Wikipedia article/template text directly. This will also form the basis for adding new structured content about genes into Wikipedia such as explicit connections between genes and disease. Specifics. Convert the pygenewikibot to deposit the data used to populate the gene articles into WikiData. (see issue tracker). Add visualization elements to one or both of the gene wiki (Wikipedia) and GeneWiki+ that display the information from wikidata. You should consider this project if: you know Python, you are excited about working to make Wikipedia better, and you want your work to be used by millions of people every day. Background. Dizeez is a simple quiz game about connections between genes and diseases. Players learn about gene-disease connections through game play. In addition, the system learns new connections suggested by many different players – thus providing a mechanisms to crowdsource the creation of a new gene-disease database. Building on some early success with a simple Dizeez webapp, this project will bring this game into the Facebook context – hopefully garnering many more players, creating a more enjoyable player experience, and producing better data. API to sync game play results and get back new gene & disease options. mode 1: auto-switch to multi-line query mode when users paste into a multi-line text into default input box. mode 2: switch to multi-line query mode by a link or button. if mode 1 is hard to implement, this will be the fallback option. Refer to this post for setting up a BioGPS dev environment. Also note that, if preferred, this project can be developed as a standalone application as well (without BioGPS dev environment). The integration with BioGPS can be done in later stage. ID mapping Users can copy/paste or load (from a file) a list of gene identifiers, and then specify one or multiple identifier types (Entrez GeneID, RefSeq ID, Uniprot ID, etc), the fields they want to output (the default will be “symbol”, “name”, can be any fields supported by MyGene.info API). The output will be a table of matching genes with user-specified output fields. User table annotation This is tightly related with “ID mapping”. The difference is that users will load a table from a file (tsv, csv, xlsx, etc), then specify which column is the “identifer” column they want to query for the gene annotations. They will then specify the identifier types and output fields as well. The output fields will be inserted into users’ table as additional columns. A “download” link will be provided for users to download the entire annotated table. It works similar to google map�����s sharing button below, we will put a “sharing by link” button in gene report page. When the button was clicked, a “long” url is generated, which contains all information to re-produce user�������������������s current gene report view. Allow to generate a persistent “short-url” version of the long one (http://biogps.org/view/qMjXHuaG). Another idea is to delegate this feature to external “url shortener” service. Refer to this post for setting up a BioGPS dev environment. Background. 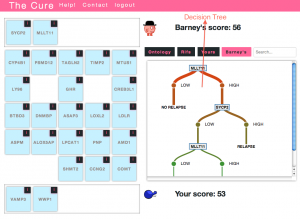 The Cure is a game related to machine learning and classification in biological domains (especially breast cancer). In the current implementation, a decision tree is automatically constructed, tested and rendered by the system based only on the player picking which variables (genes) to use to build it. Idea. Create a new game interface that lets the players interactively construct the decision trees based on any number of genes of their choosing. This would basically be an ‘expert mode’ that gave players full control. The trees would be evaluated (server-side) based on how well they classified the training set, how big they were (smaller is better), and how biologically meaningful the group of genes in the tree is. Idea: For this year’s GSoC, we propose the development of a Semantic BioGPS display plugin. This would query the data extracted from all of the annotated plugins and display it in the context of BioGPS. The data to be displayed would be in a triple structure with the gene as the subject and could have a large variety of properties (predicates) and object types. While this interface is the end goal, the project would also need to improve on the current annotation authoring pipeline to ensure that it is robust enough to support a public interface. This will likely involve refinements to the annotation authoring interface and regularly scheduled crawls of the biogps plugin library. ��Because of the nature of the task (parsing structured data from semi-structured and transient HTML) robust error-handling is vital to consider at every step.